Nick Compton thrashed his consecutive Test ton followed by a century from Jonathan Trott and put England into a commanding position vs. New Zealand in the 2nd Test. The English batsmen made full use of the opportunity to bat first, provided to them by the Black Caps and powered 267 runs for the loss of just two wickets in 90 overs. The second Test of the three match series commenced on Thursday, March 14, 2013, at Basin Reserve, Wellington. Earlier, the skipper of New Zealand, Brendon McCullum, won the toss, misread the pitch and offered the batting to England. The visitors got the first shock when their captain, Alastair Cook, was caught by Peter Fulton at mid-on at the bowling of Neil Wagner for 17 as the score reached 26 in 10.1 overs. 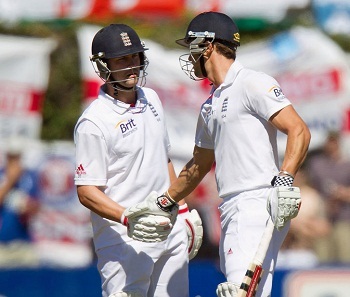 He was replaced by Jonathan Trott who opened his account with a single as Compton hit two fours in the same over. The batsmen took their time to settle down and later started getting boundaries at ease and the score board touched 75 after 28 overs at the lunch interval. Nick Compton was the most attacking of the two and attained his fifty in the 33rd over as the score went past the hundred runs mark. He added another 2 fours in the next over as Trott continued creeping from his end. The run rate slowed down a bit after that and Trott scored his fifty on the 106th ball of his innings in the 48th over. The score board kept cruising with occasional boundaries and displayed 162 runs after 58 overs at the tea interval. Trott got back to his rhythm after the tea break and the ball was travelling out of the fence regularly from his willow. He hit another two fours in the 65th over as Compton added 10 runs in the next over with a couple of boundaries. The duo was going side by side as Jonathan Trott smashed his ninth Test hundred on the last ball of the 70th over with a four. Nick Compton continued with his excellent form and plundered his consecutive century in the series two overs later that included 2 fours. The pair shared a 236 runs partnership for the second wicket and took the score to 236 when Nick Compton was caught at slip by Ross Taylor off Bruce Martin for 100 off 230 balls with 15 fours. Kevin Pietersen came in next and preferred to get himself accustomed with the strip while playing watchfully. 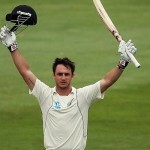 Trott remained unbeaten for 121 from 234 deliveries with 15 fours as Pietersen was at the other end with 18 off 48 balls. The tourists amassed 267 runs in 90 overs at stumps on day one with eight wickets still in hand. England is in a comfortable position, with two set batsmen at the crease and plenty of batting to come they can get a challenging first innings total against New Zealand.